Q: What is the Dorje Shugden conflict actually about? Thierry Dodin: This conflict arose in the 17th century and since then has played out on many levels. In essence, the question is whether the four main schools of Tibetan Buddhism, – Nyingmapa, Sakyapa, Kagyupa and Gelugpa – are equal or whether one of them, the Gelugpa School, is more “pure” and therefore outranks the others. Incidentally, the Gelugpa School is the one to which the Dalai Lama belongs. Q: So does the Dalai Lama wish to make his own school dominant? Monks in South India demand the departure of Shugden practitioners from their monasteries. Q: So is this a purely religious conflict? Thierry Dodin: Actually, no. Between the various schools of Tibetan Buddhism there are no significant differences in terms of teachings, and most definitely not within one and the same school. What is a source of problems are what we call the “lineages”: within the individual schools, teachings and instructions are passed down from teacher to student and from one generation to the next in uninterrupted succession. Sometimes very crass rivalries exist between these different lines of transmission, which often function as some kind of ‘old-boy’s network’. Overwhelmingly central here is ‘group identity’, the feeling of belonging and togetherness. This can readily be assigned to the category of politics, if only because power issues are bound up with it. At stake here is for instance ownership of monasteries, and/or, in old Tibet, their estates, etc. The greed for power, status and wealth, the “unholy trinity,” does not spare even Buddhist monastic orders – human beings are and always will be human beings. Still, beyond this essentially political and very human trait, there is also a religious dimension to consider. This is related to the primordial role that the teacher-student relationship plays in Tibetan Buddhism. Loyalty to one’s teacher is felt very deeply. This in turn makes it very difficult for students to critically question traditions they have received from their teachers – such as the Dorje Shugden cult – let alone distance themselves from it. Q: Isn’t this in crass contradiction to the injunction of the Buddha to his students to subject even his words to question over and over and again? Thierry Dodin: Yes, clearly, there is contradiction to this cardinal point in the teachings of the Buddha here. But then, human beings are not exclusively rational creatures. Even if they know better, they will always find good reasons to believe things that, one way or another, keep them in their comfort zones. It is always easier to spirit something away through belief than to question familiar notions, and thereby incur pain. This applies to both religious and non-religious people. Q: How did the conflict arise historically? Thierry Dodin: In the 17th century, The Fifth Dalai Lama united Tibet politically, and in doing so, for reasons of realpolitik, made use of his school, the Gelugpa School, as an institutional support and primarily favoured it with offices and areas of responsibility. But in religious terms he was genuinely tolerant: in fact, a few of his most important teachers belonged to other schools. He therefore not only took his own Gelugpa School into consideration in the creation of the Tibetan state – his great political accomplishment – but also entrusted a few institutions and state rituals to other schools as well. However, this gesture alarmed and outraged powerful members of the Gelugpa School who professed the exclusivity and superiority of their own school. They formed a faction united around the cult of what is called a “protector deity”, one hitherto rather unknown: Dorje Shugden. This, by the way, does not necessarily mean that this faction was set up around specific religious positions. Rather, it was customary in old Tibet to place even decidedly secular matters under some kind of sacralised protection. Following the death of the Fifth Dalai Lama in 1682, the cult spread rapidly and broadly within the Gelugpa School, particularly among those in political positions. Thus, in the course of time, followers of the Shugden cult came to almost completely dominate the state institutions of old Tibet. They also set the tone in exile institutions during the initial years of exile in India and Nepal until well into the 1970’s. Essentially, the Shugden cult ascribed a religious dimension to a clear separation between the Gelugpa and non-Gelugpa schools. But the central endeavour was the monopolisation of power and resources in the hands of a tightly-knit group; in other words, it was very definitely a political matter. Q: What role does the current Dalai Lama play in this conflict? Thierry Dodin: It is due to his efforts that a more tolerant, pluralistic and democratic practice emerged in the 1970’s, and gradually prevailed over the conservative “old guard” – mostly Shugden followers. At about the same time, the Dalai Lama began to express scepticism about this cult. With time, his position here became increasingly evident. Today, Shugden supporters have become politically almost completely insignificant in the exile community. 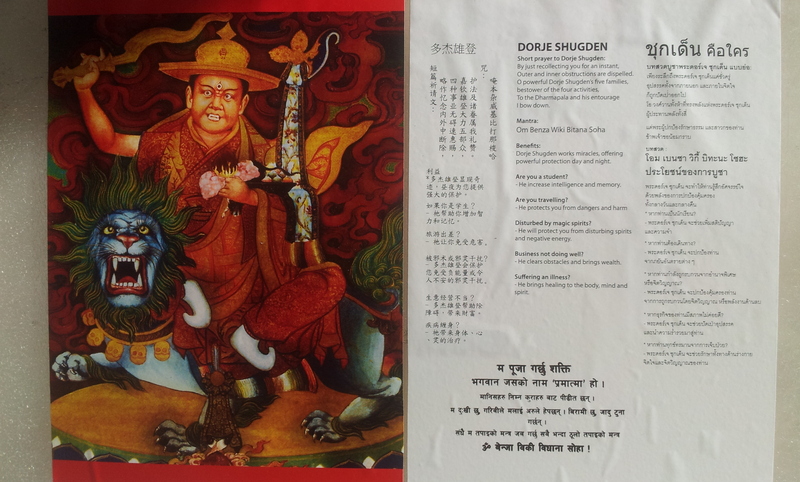 Q: The Shugden adherents accuse the Dalai Lama of having prohibited this practice and therefore repressing religious freedom. Is this accusation justified? Thierry Dodin: No, such a prohibition does not exist. Religious freedom is not at issue here. No one, and most definitely not the Dalai Lama, is repressing religious freedom. The issue here is power and influence. The Dalai Lama simply advised against this cult. He is also very aware of the painful dilemma which many Shugden practitioners are facing in giving up a cult they have received from their teachers. Technically speaking, the Dalai Lama could not issue such a prohibition in any case. He is not authorised to issue instructions to anyone, as for instance the Pope is in the Catholic Church. He is not even, as is often erroneously assumed, the head of the Gelugpa School – the Ganden Tripa is. He did however request those who continue to practice the cult not to take part in teachings or empowerments he gives. In doing so, he has created a kind of socio-spiritual ‘buffer zone’, probably in the assumption that any process of letting go takes time. But when it became evident that the group had entrenched itself in key monasteries in southern India, he called upon the remaining monks to create clear parameters. The Shugden adherents then had to withdraw to monasteries exclusively dedicated to this cult, or they founded new ones in other locations. The point was to create a clear separation, not to destroy the Shugden group, as the latter sometimes claim. When one considers that the Shugden group once dominated both Tibetan politics and the Gelugpa School in a very sectarian fashion – a state of affairs that democracy and not least the influence of the Dalai Lama have in the meantime eliminated – one can then understand why some influential Shugden followers hate the Dalai Lama and would like to cause him as much harm as possible. Q: A further accusation against the Dalai Lama is that he and the Central Tibetan Administration (formerly known as the Government-in-Exile) exclude Shugden adherents from medical care and education and refuse them identity documents. Thierry Dodin: It is true that the cult is shunned by the community. But the claim that its remaining followers are systematically discriminated on the basis of an official directive cannot go unchallenged, if for no other reason than the fact that they themselves choose to live in groups largely cut off from the rest of the community. Majnu Katilla Tibetan camp in Delhi, India. Q: Couldn’t the Dalai Lama put an end to such excesses by simply calling upon his countrymen to refrain from them? Thierry Dodin: This is a polemical question that insinuates that numerous and violent incidents had occurred over a longer period of time. But this was not the case. Q: Does China have a role in this conflict? Thierry Dodin: As I said, the Shugden question has been an issue in Tibet for the last 300 years. Both Shugden followers as well as the various rulers in China have repeatedly sought – more or less skilfully – to harness each other for their respective power games. Sometimes they were very close allies, sometimes they were adversaries. At present, the Dalai Lama and the Shugden group are standing in opposition to each other, and it therefore stands to reason that China would seek to make use of this situation and that the Government would do everything to advance the cult. For instance, the construction of Shugden temples and monasteries is being subsidised by the State. We also know that most of the teachers surrounding the young man who in 1995 was designated as the Panchen Lama by the Chinese leadership, against the will of the Dalai Lama, belong to the Shugden group. I think these examples clearly demonstrate the role China is playing in this conflict. Incidentally, this in turn leads to further tensions, above all in Tibet itself. As I mentioned, it is a difficult step for many Shugden follower to give up the cult. This is of course especially true of older monks. Hence, they might continue the cult, but will do so discretely, because they also continue to revere the Dalai Lama both as a person and as an institution. The vilification of the Dalai Lama by China and China’s obviously not religiously motivated support of the cult naturally confronts them with an additional ethical dilemma. Q: Is the cult also widespread in the West? Thierry Dodin: At present there are three different Shugden groups. One of them, operating under the guidance of Lama Gangchen – he lives in Rome – has a very close relationship with China. This group works to revive the cult in Tibet in areas where it had, for all intents and purposes, disappeared. The group’s members also work closely with a group of Chinese followers of Tibetan Buddhism operating internationally from Singapore. Then there is a second, small Shugden group made up almost exclusively of Tibetans. Most of them live in India but a few of them in Switzerland as well. For many years, the most important authority was Dagom Rinpoche. After his death, Lobsang Yeshi took over this role. He claims to be the reincarnation of Kundeling Rinpoche, an important lama of the Gelugpa tradition. He is widely regarded as an usurper and earned himself the nickname of nga-lama (me-lama). There is another Kundeling Rinpoche, this one is recognized officially and by the Dalai Lama. The group best known in the west is the New Kadampa Tradition (NKT). It was founded by Geshe Kelsang Gyatso, a scholar who dissociated himself from the Dalai Lama when the latter openly declared his rejection of the cult. The NKT can be described typologically as a cult on the basis of its organisational form, its excessive group pressure and blind obedience to its founder. The organisation’s extreme fanaticism and aggressive missionary drive are typical cult features too. This is the group that since the 1990’s has held spectacular demonstrations whenever the Dalai Lama went to the West. Tibetans are only very sparsely represented in the NKT. The demonstrators are almost exclusively western monks and nuns, ordained in the NKT according to the group’s own ritual. Here’s a poster one finds increasingly throughout Southeast Asia. The photo was taken on 2012/02/06 at a bus station in Melaka, Malaysia. On the poster, Shugden is praised as a worker of miracles, one who offers 'powerful protection day and night', who increases intelligence and memory, and protects against disturbing spirits. He is said to heal, bring wealth, and to clear obstacles (particularly in business). Shugden image in Kuala Lumpur. 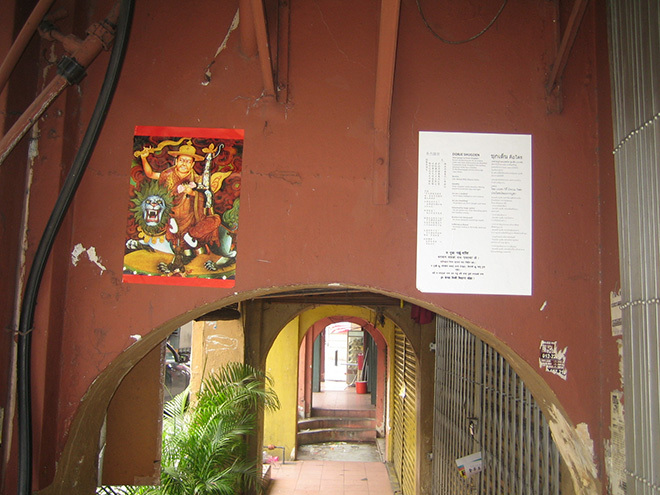 These images are placed at strategic locations, near temples, at Buddhist bookstores and even pasted at bus stops. 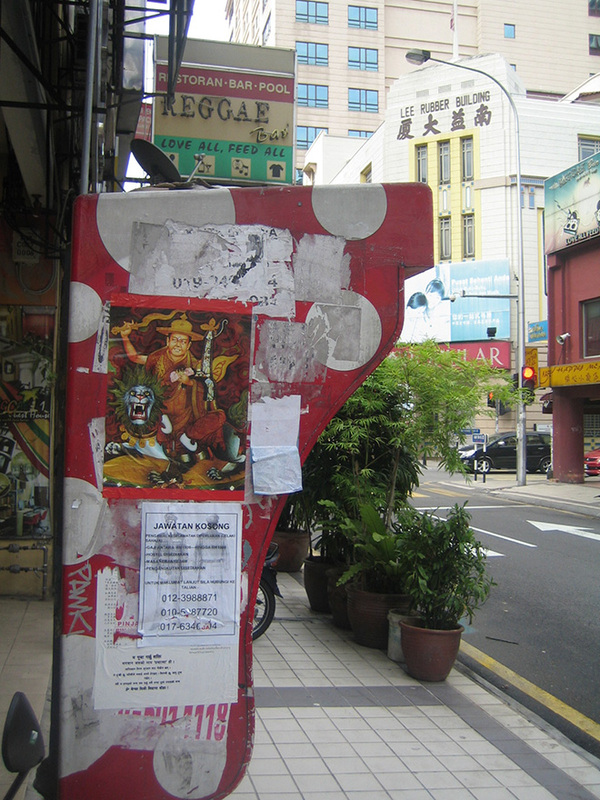 Shugden image in Kuala Lumpur at a bus stop. 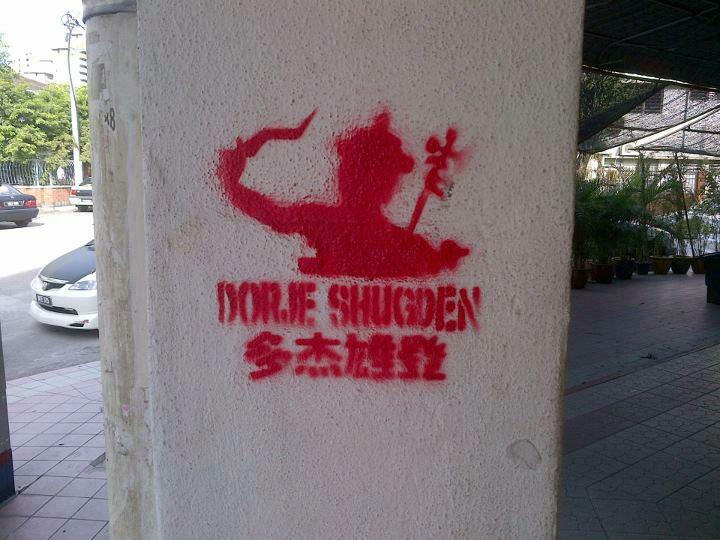 Shugden graffiti in Kuala Lumpur. Q: Do these three groups work together? Thierry Dodin: Their relations among each other are quite complex, if for no other reason than their cult structures, which don’t exactly promote pluralism in leadership. Then there are the differences in their posture towards China. Gangchen Lama, as I mentioned, works closely with the Chinese authorities. Geshe Kelsang Gyatso and his NKT are distinctly more distanced towards China. But the “Kundeling Group” is coming increasingly under the influence of China. However, there is also resistance, since a few of its members also fought against China in the past. 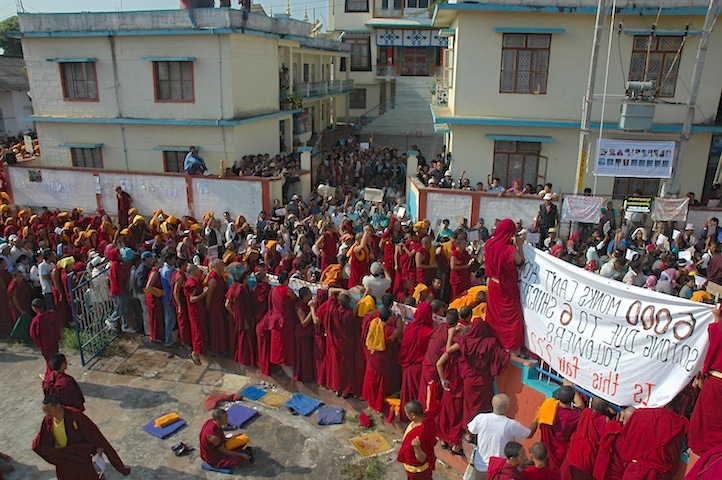 The two last groups cooperate at least informally in demonstrations against the Dalai Lama. However, the demonstrations are primarily organised and carried out by the NKT. Singapore has become a Shugden stronghold, arguably financed by China. From there, efforts are being made to unify the Shugden movement, to make it more efficient – apparently with success. Q: Is the Shugden group in fact fighting against religious oppression and persecution and for religious freedom, as they claim? Their campaign insinuates that they are being subjected to massive, overwhelming persecution. Thierry Dodin: Well, let’s look at it logically; let’s look at the facts: the Dalai Lama advises against a cult that he views as a misguided development within his own Gelugpa School. He does not call for wiping out the group’s adherents or destroying their monasteries, but instead simply calls for a clear-cut separation within the monastic context. The Dalai Lama has distanced himself from the Shugden group, and the Shugden group has dissociated itself from him. Thus, in point of fact, there are no longer any overlaps, no more interfering in the affairs of one by the other. Hence, there can be no oppression either – all the less so when the Shugden group, as for example the International Shugden Community, claims in its flyers that this Dalai Lama isn’t even the right one! Why should they let a “false Dalai Lama” whom they do not recognise forbid – or permit - them anything at all? It just doesn’t make sense! Dodin, Thierry (02. April 2016). Shugden followers are not giving up protests against the Dalai Lama. Dodin, Thierry (03. Nov 2014). The making of a Shugden hub in the United States.